Olympus E-M10 Announced. Take an E-M5 and tighten in up a bit so that it's a little bit smaller, especially in height, but otherwise recognizable. Stick in some of the E-M1 electronics (including WiFi), simplify the stabilization to a three-axis system, remove the weatherproofing and accessory port, and you've basically got the E-M10. Read article on sansmirror.com. E-M10 entry in Camera database. Olympus 9mm. Olympus 14-42mm collapsing lens. Olympus 25mm f/1.8. How Myths Get Started. I can't count how many "if only Nikon would update firmware like Fujifilm does" emails I've been getting lately. Article on dslrbodies.com. 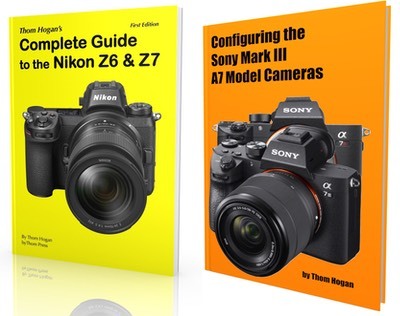 Mirrorless Challenging DSLRs? With today's announcement of the Fujifilm X-T1 (and tomorrow's Olympus E-M10 announcement), you're seeing more people considering mirrorless cameras instead of DSLRs. Read the article on dslrbodies.com. Panasonic GX7 Review. The Lumix GX7 is the most recent in Panasonic's rangefinder-style, prosumer-type bodies. Read the review on sansmirror.com. Fujifilm X-T1 Announced. This 16mp X-Trans II sensor camera is styled like a DSLR (mid-camera prism hump), and a retro one at that (widespread use of traditional dials instead of buttons). Read the article on sansmirror.com. The Unanswered Questions. Serious Nikon users have a whole host of questions they would like answered these days. See what they are on dslrbodies.com. Fujifilm 16-50mm f/3.5-5.6 XC OIS Lens Review. The 16-50mm f/3.5-5.6 XC OIS lens is the kit lens with some of the lower-priced X mirrorless cameras from Fujifilm. Read review on sansmirror.com. Nikon Has a PR Problem. I actually wasn't going to write about this, but two things happened… Article on dslrbodies.com. SilentSifter 3. The question is this: what are you going to do if you didn't use a hierarchical folder structure from the beginning of your digital imaging? Article on dslrbodies.com. Nikon 18-140mm f/3.5-5.6G DX Lens Review. Nikon has gotten better with each generation of its convenience zoom designs (both DX and FX), and the 18-140mm is just another example of that. Read review on dslrbodies.com. Nikon Updates Df, D3200, D5200 Firmware. Article on dslrbodies.com. Fujifilm X-A1 Camera Review. Simply put, an X-A1 is virtually an X-M1, but with a regular Bayer sensor instead of the X-Trans sensor. Read review on sansmirror.com. Someone at Fujifilm Thinks Like Me. 've been harsh about Nikon's decisions regarding the dials on the Df camera. In virtually every case I suggested that there was a better design that Nikon avoided. Article on dslrbodies.com. The Nikon DSLR Sweepstakes Game, 2013. You've entered a sweepstakes and the prize is "any current Nikon DSLR." Which one do you take? Article on dslrbodies.com. About Lens Reviews. (Updated) You'll notice a few things about my lens reviews, in particular the lack of measurement numbers or test chart samples. Article on dslrbodies.com. Another Day, Another Reuters Article. Reuters is reporting that Nikon has cut its full-year profit target (both this year's and next's). Read article on dslrbodies.com. This Week's Software News. Photoshop. Apple raw. DxO Optics. New programs. Article on dslrbodies. No Nikon at Imaging USA. For the first time in the last six years, Nikon did not have a presence at the show. Read article on dslrbodies.com. Nikon 58mm f/1.4G AF-S Review. The 58mm f/1.4G was a bit of a surprise. Nikon already has quite a few lenses available in the "normal" focal length range for FX, so why another one? Read the review on dslrbodies.com. What Can We Do Better Now? Here's a question you probably don't ask yourself: what equipment appeared in 2013 that allows us now to do something we weren't able to do the year before? . DSLR version. Mirrorless version. BCN's Final Japanese Market Share Numbers for 2013. BCN has reported both the final DSLR and mirrorless market share numbers for the 2013 Japanese market. DSLR version. Mirrorless version. Trends Fore and Aft. I saw this with the D800 and now we're seeing echoes of it with Sony A7 and even some other cameras: self reinforcement on the part of the purchaser. Article on dslrbodies.com. The Nikon D4s First Warning. Nikon announced they will be showing the D4s at their booth at CES, but announced no real details. Article on dslrbodies.com. New Sigma Lenses. Sigma announced new 50mm (FX) and 18-200mm (DX) lenses. Article on dslrbodies.com. New Nikon Lens. As expected, Nikon announced the 35mm f/1.8G AF-S lens. Article on dslrbodies.com. Another Weak Update: the D3300. Nikon today at CES announced the entry-level D3300. Article on dslrbodies.com. This Month's DX Lens Plea. Have you ever knocked on a friend's door when you know they're home, but no one answers? Article on dslrbodies.com. Panasonic Officially Launches the 42.5mm f/1.2 Lens. Now with a price: US$1700. Article on sansmirror.com. NEX Disappears — A5000 Appears. The NEX to Alpha-only transition is fully underway now, as Sony officially launched the NEX-3N successor, the A5000. Article on sansmirror.com. I believe I've caught up to all the major CES announcements at this point. Frankly, the most interesting announcement so far is the US$2000 Sony FDR-AX100 camcorder [advertiser link], which is a 1" sensor 4K video camera that probably presages a stampede towards low cost 4K. Learning from Others (Sports Photographers). What can you learn from a sports photographer? A lot. Learn what on dslrbodies.com. Nikon Camera Pin-Outs. I've added to the pin-out articles on the dslrbodies.com site. Fujifilm Announces 56mm f/1.2 Lens, New Road Map. 16-55mm and 50-140mm f/2.8 lenses? Sign me up. Article on sansmirror.com. More on the Nikon Df Split Personality. Lots of reviews have appeared now, with lots of opinions. Read article on dslrbodies.com. Answering My Own Question. A few days ago I asked whether new gear you acquired made your photography better. Today I'm going to answer that question (at least partially) for myself. Read article on dslrbodies.com. The Sky is Falling, the Sky is Falling. Better sign up fast for that Adobe Photoshop CC offer at US$9.99 a month because it will expire soon. No, wait a minute, not that soon. No, wait a minute, still not that soon. No, wait a minute, we didn't mean that soon. Read article on dslrbodies.com. Best Upgrade for a New Camera Kit. For Nikon DSLRs. For mirrorless cameras. BCN's Preliminary 2013 Numbers. A lot of blogs are writing about BCN's preliminary tally of camera sales in Japan this week. Read article sansmirror.com. Samsung NX30 and 16-50mm Lenses Announced. Once again in 2013, Samsung is the first out of the gate with a new camera introduction, but note the direct Dropbox and Flickr support. Read article sansmirror.com. End of Year Software News. onOne Software Perfect Photo Suite 8.1. PrinTau 8 for Canon printers. Nikon Cleaning Up the Servers. I've written it before, but in the digital age you really need at least three sets of your images. Read article on dslrbodies.com.